It was created as a side-story to Fairy Tail which showed the origins of the guild and focused heavily on Mavis, the first guild master. It was called Fairy Tail Zero and it was an amazing story that captured a lot of emotions all in the span of just a few chapters. Since the original Fairy Tail anime’s story is catching up to the manga, Hiro Mashima and A-1 Pictures decided to adapt the side story into an anime! While many believed that this anime adaptation would be its own series, it’s not. They’re adding it into the original series’ episode list so some people would see this as filler, but it is anything but that. 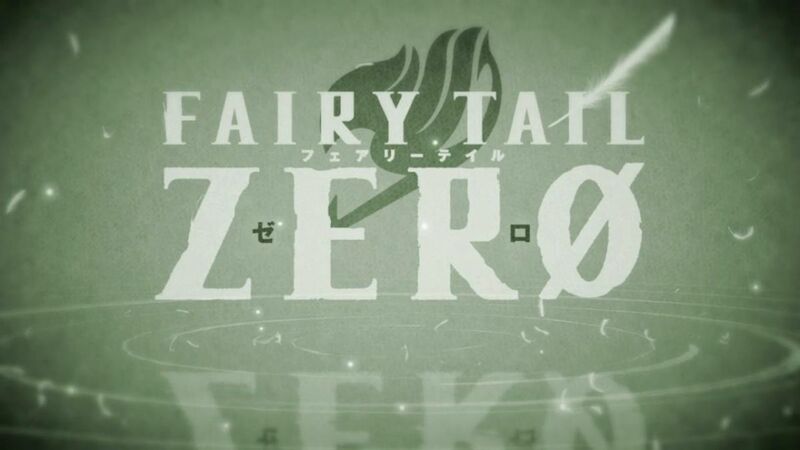 No matter how A-1 chooses to showcase it; I still consider this an anime on its own so therefore, it’s time to take a look at Fairy Tail Zero! The first episode started off with some story from the main manga. Natsu and Happy are off to do their training and end up on Tenroujima Island. Despite embarking on a quest to train, they don’t exactly get much training done. They do stumble across the ruins of an old village on the island and this is where we transition back in time to when Mavis lived on this island. Right off the bat we are given a kick right in the feels when we see how Mavis’ life is. She’s treated extremely poorly by the guild that she’s a part of. Red Lizard took Mavis in when she lost both of her parents, but the guild master treats her like a slave as he forces her to do all the hard work around the guild. One day Mavis received a pair of shoes so she wouldn’t have to do all this work barefoot, but the guild master just took them away and gave them to his daughter Zera who shunned the shoes because they were worn by Mavis. Mavis is then sent to deliver Zera’s lunch to her at school. Mavis spends a lot of time reading so when she finds Zera in the school’s library, she’s ecstatic that there are so many books. Sadly, she doesn’t get to read any of them as Zera scolds her for being late and sends her away. She even gets her friends to turn on Mavis after seeing them adore her. That’s pretty cold. When Mavis gets back she discovers the guild is under attack by the guild Blue Skull. Everyone in the village is murdered and Mavis escapes, saving Zera in the process, but Zera collapses and this is how the first episode ends. This is how you start a story off with a bang. There is so much emotion in the form of sympathy that it’s a bit overwhelming, but in a good way. Hiro Mashima made you care about Mavis by making you feel sorry for her. More often than not something like that falls short and ends up being either half-assed or it feels forced. In this instance, it just feels natural because you just get to see her life unfold in front of you rather than just have a character talk about it with another character like most manga/anime seem to do these days. Mavis’ cheering attitude and her iron will through the entire ordeal are also a great selling point on the emotion as it just enhances it so much. The first episode was a hit and if you love Fairy Tail, I implore you NOT to skip over this “filler” as you will regret it! The opening theme is pretty good! “Ashita wo Orase” by Kavka Shishido starts off a bit harshly, but it does it in an energetic way to get you pumped. Then the chorus comes in and it’s more melodic while still keeping that hype energy flowing. It’s not the best Fairy Tail opening I’ve listened to, but it’s far from the worst. It’s a very good song that is worth checking the full version out when it’s released! The ending just hits you in the feels. “Landscape” by SOLIDEMO is a very soft and somber song and after the way the first episode ended with Mavis crying after Zera passed out it really makes you hold back the tears. It just has the soft vibe to it that fits the ending perfectly. Fairy Tail has had some of the best ending songs throughout the years and this just measures up with some of the best! YES – It’s Fairy Tail… it’s a bit darker than the regular story and it was an amazing read in the manga. If you’re a Fairy Tail fan, chances are you already watching this.